1) What was your plan going into the race? I wanted to run 79-80 second splits and come through the mile sub 5:20 to set myself up for a fast time. My larger goal going into the race, though, was to gain some necessary confidence as I head into this track season. I hadn't run a 3200m fresh since the end of my sophomore year so, for me, it was a great chance to see how far I've come since then. 2) Did you talk to any of the competitors before the race and was there any idea how the race would unfold? Can you take us a bit through your own race? Over the winter Brooke Starn and I became good friends, bonding over some great long runs together. Before the race, we talked together about race strategy so we could help each other run a fast time. 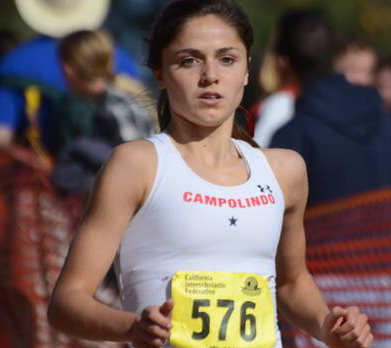 I was also lucky enough to have four other talented Campo girls in my race whose goals and strategies we discussed as a team earlier in the week. So, I had a pretty good idea of what paces people would be shooting for during the first mile. However, it's tough to know how any race will ultimately unfold because, until you're running that fifth and sixth lap, you never really know what kind of day you or your competitors will have. Yesterday, I came out of that first mile feeling great. In fact, those first four laps went by incredibly fast and from that blur I really only recall Chuck's booming voice yelling my splits across the track (he's kind of tough to ignore). And then the last half was all about trying to maintain my speed and test my fitness. I also had some supportive teammates, coaches and parents cheering me through those tough final laps. 3) What is your current weekly mileage? Length of long run? What workouts have you done recently? Doing anything different this year compared to other seasons? My weekly mileage for this week was a bit higher than normal at about 67 miles total but most weeks I aim for around 60-65. My longest run of the week is usually about 90 minutes, which is about 10 minutes longer on average than last year. But long runs are my favorite day of the week so I love the extra time on the trails :) As for my workouts, we always have some sort of longer tempo workout on Monday and then a higher intensity, speed-based workout on Wednesday. Overall, my training has been pretty similar compared to previous seasons, but with a bit more emphasis on high mileage. 4) Can you tell us a little bit about your coach and how he has helped you develop into the runner you are today? Everyone knows that Chuck Woolridge is a fantastic coach. He is organized, intelligent, and incredibly dedicated to our team and I trust his training completely. For me, though, he has also been more than just a coach. High school has been a bit of a roller coaster for me, things certainly haven't always gone my way; but Chuck has continued to believe in me even when I didn't always believe in myself. I am incredibly grateful for his support throughout these past four years. I would also like to thank Mandee Starn for her recent support in helping me learn how to manage my vocal cord dysfunction. Her kindness and expertise were invaluable. 5) What is your next big race for you? My next big race is the Stanford Invitational where my team will be running in the DMR on Friday night. I am also really looking forward to competing in the Arcadia Invitational the week after that because I've yet to go and I've heard it's quite exciting! 6) You will be attending Princeton next year. When and what factors led to that decision and how many other schools were in the mix? I had long ago decided that I wanted to go to college on the East Coast and, with a sister already at Dartmouth, I was looking mostly at Ivy League colleges in my search. I visited Yale, Dartmouth, Harvard and Princeton and really loved all four. However, after my official visit at Princeton I knew that it was the school for me. I loved that it was a small school with a big cross country team. Princeton is also undergraduate focused and in an adorable college town. In addition, Coach Farrell is exactly the kind of coach I was looking for, confident but also patient and understanding. Not to mention, the campus is absolutely stunning with some great trails super close to campus!